Michael & John Job Centre(MJC) is the manifestation of a unique vision: the vision of “Empowering the Girl Child through education”. 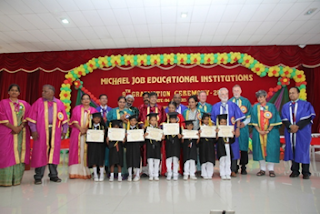 The 9th Graduation day of the MICHAEL AND JOHN JOB EDUCATIONAL INSTITUTIONS was held on Saturday, July 04, 2015 in the John Job Auditorium. Mr. Mathew Samuel IAS, Secretary in charge of Sports, Panchayati Raj and Rural Development of the Government of Goa was the Chief Guest. We also had an impressive array of Guests which included Ms.Deepika Mittal,IRS Mr. S V. Paramasivam, Director.Rural Health services Coimbatore Rtn Sanjay Shah and Rtn Shafiq President and Secretary of Rotary Spectrum Coimbatore, Rtn Krishnakumar Payel, Mr Balamurugan reputed Industrialist, Ms Sonali Geed from IPS, Mr.Markus Zuercher, from Switzerland, Dr Hans Braun from Germany and Rev Jan Bor from the Netherlands. 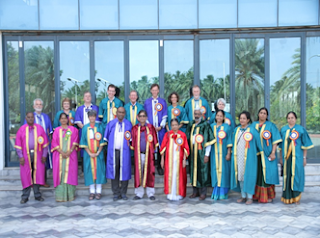 After the Academic Procession entered the auditorium, the dignitaries were escorted to the dais by the students. The program began with the Tamil Thai Vazhlthu. 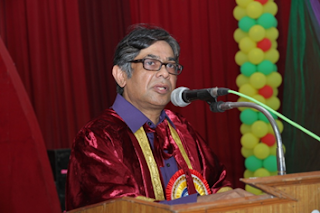 Then Mr.T.Koshy, Vice President introduced and welcomed the guests and the all those attended the program. In her presidential Address, Dr. Mary Job, the President appealed to the students to help the people, especially the women in need and also pledge to give back to the society after their studies. The Chief Guest in his speech encouraged the graduates to develop their communication skill and aspire to become great leaders. 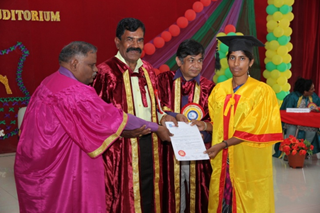 Mr.Balamurugan, Industrialist, Coimbatore, Mr. Sanjay shah, president Rotary Spectrum, Coimbatore felicitated the graduates. The Chief Guest, the President along with Dr. Lali Thomas, Principal, Michael Job College of Arts and Science for Women honoured the gold medallist, university rank holders and the Post graduate students of Michael Job College of Arts and Science for Women. Ms.S.Krishnapriya, Principal Michael Job matriculation higher secondary school honoured the school topers and cash prizes were given to them. Mr.Babu.P.Varu, Trustee, Rtn K.K. Payal and Mr. Markus Zuercher distributed the degrees to the graduates of Michael Job College of Arts and Science for Women. Mr.S.V.Paramasivam, Director Rural Health Service, Coimbatore, Ms. Deepika Mittal along with Dr.D.Devenesan Sanjeevi and Mr.T.Koshy, gave away the certificates to the graduates from Michael Job College of Education. Rev. Jan Bor and Mr. Sanjay Shah along with Ms. Elizabeth Koshy, and Ms.S.Krishnapriya Michael Job matriculation higher secondary school honoured the students of the school. Rev. Hans Braun and Ms. Sonali Geed issued UKG certificates. 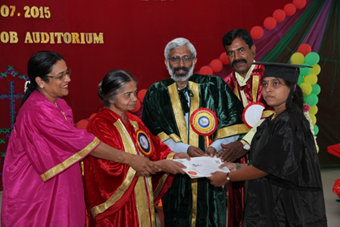 The Rotary Spectrum Coimbatore recognized the toppers and the best teachers with Cash awards. 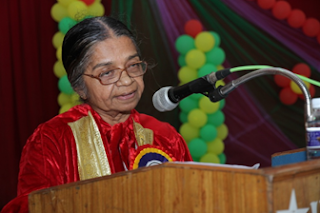 Ms. Jeevitha, Assistant Professor, Department of English, Michael Job College of Arts and Science for Women was the Master of Ceremony. The function ended up with the National Anthem. This report was prepared by Ms. Jeevitha, Department of English, MJCAS. I maintain this site to support a unique institution called MJC. An institution working towards "Empowering the Girl Child through education"